Kumar accepts his prize from Grant Lawlor, National Groups Manager (pictured left) and Robert Smith, Business Development Manager, Eastern Ontario (pictured right) Unique Vacations Canada Inc.
Kumar Thusyanth, Manager, CWT in Pickering, Ontario is the lucky winner of a 3-night stay to a Sandals or Beaches resort. 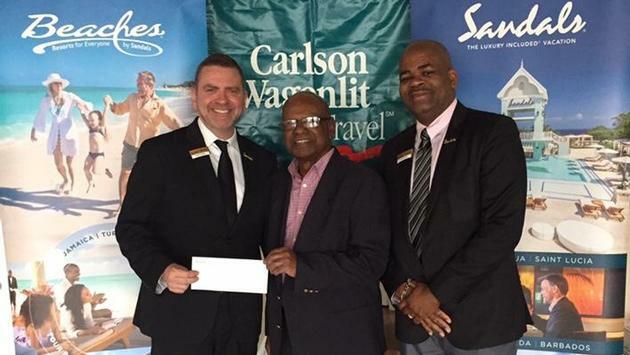 Kumar Thusyanth, Manager, CWT in Pickering, Ontario is the lucky winner of a 3-night stay to a Sandals or Beaches resort. Hot on the heels of Kumar’s prize presentation, Sandals is pleased to announce that the group booking incentive continues with a brand new contest period for Q1 2019. Canadian agents who book any type of group – social, corporate or wedding – of 5 rooms or more at any Sandals or Beaches resort now through March 31st will be automatically entered for a chance to win a 3-night stay of their very own. No entry form is required. Contest is valid for all contract groups, booked with either a Canadian tour operator partner or Unique Vacations Inc. Restrictions apply and it is not valid for agents in Quebec. Every new group booked equals one contest entry, so the more groups booked translate into more contest entries for the agent – and – groups booked to Sandals or Beaches in Jamaica receive a bonus entry!